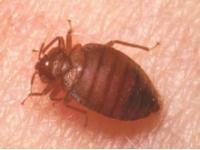 The adult bed bug is oval shaped, 3/16″ long, and is a rusty brown color. The bed bug is completely flat but becomes elongated as it fills with blood. Bed bugs do not fly or jump but move similar to the way ants move. Bed bugs hide in cracks and crevices during the day and will leave its harborage area at night to feed on its hosts. The blood meal takes about 3-10 minutes to complete and usually goes without notice to the host. After feeding, the bed bug bite may become inflamed and itchy. A thorough inspection is necessary in order to locate the areas where bed bugs may be harboring. Vacuuming these areas will help collect the eggs and live bed bugs.The vacuum bag should immediately disposed of so. Treatment with a residual pesticide will be needed and dusts may be used in void spaces such as behind electrical face plates. Significant preparation by the customer prior any treatment to insure that bed bugs are not harboring or breeding in closets or drawers. Using over the counter products in an effort to self-treat will almost always repel the bed bugs and cause them to scatter to other areas of the home, making effective eradication significantly more difficult. A professionally trained and licensed exterminator is needed for effective eradication. A to Z Pest uses Green products in control of bed bugs and also offers bed bug eradication though Heat which greatly reduces the amount of customer preparation needed.